Keith Raynor has become a staple at our URCA conferences and it’s always such a pleasure to take part in his presentations. We at Ulty Results are always trying to make the most of our off-season and Keith’s presentation on Film Analysis is a very effective way to wait out the winter months. 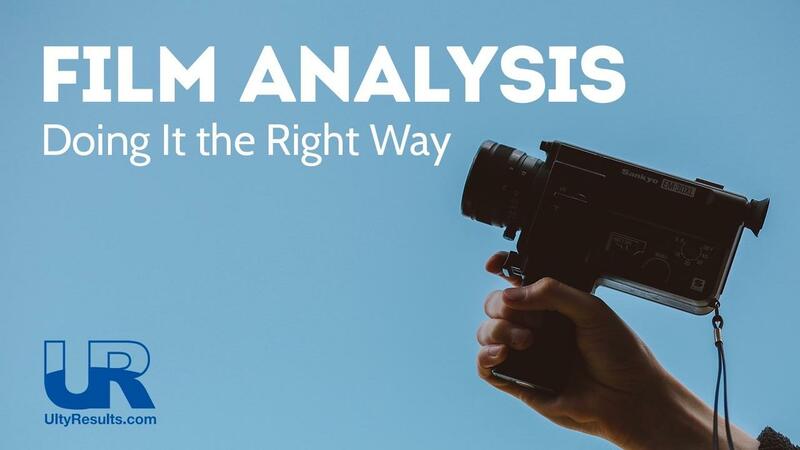 Analyzing game film allows you to access a level of detail that may not be readily available otherwise. You might play in or coach a game, but you can’t watch all things at once. Given that 65% of the population are visual learners, film allows coaches and players to get a second perspective and review plays that might have passed them by. Caption: just get out there and start filming! Anyone with a camera and computer can and SHOULD record their own game film. If you’re part of a school, there’s a good chance you can rent a camera and tripod from the media library. In terms of set-up, you’ll want to get a view that’s elevated (bleachers, a ladder, etc…) and away from distractions and visual noise. The corner of an endzone offers the benefits of getting a sideline and endzone view and is not usually crowded. Remember: try to get more than just the disc on film—you’ll want to see the plays before they start. For those that are unable to capture their own film, there are still great resources out there: Ultiworld offers packages of game film but even YouTube and Reddit can provide great material to review. Blank Slate Session: there’s no plan and you’re not sure what you’ll find. This is common in reviewing your own footage for the first time. Seeking Specifics: you’re looking at old footage to reinforce ideas or teach new concepts. You have an idea of what you’re looking for and what it’ll look like when you find it. Reviewing and Scouting: when you want to analyze your or your opponents strategy to identify strengths and weaknesses. 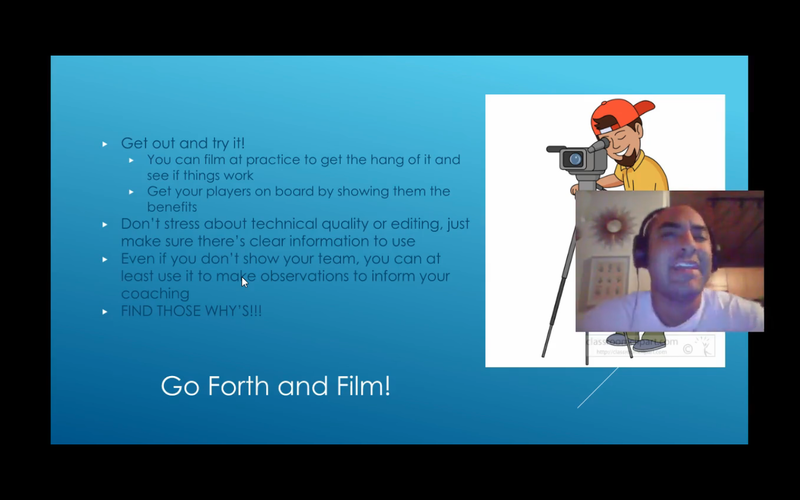 Keith warns against spending too much time analyzing your opponent’s footage over your own—on a per hour basis, your time is much better spent watching your team’s own film. When watching game film, it’s easy to get distracted by a great throw, a crazy play, or a player you want to watch. This is why Keith advocates for watching film three times; once to get the entertainment out of the way, a second time to set expectations and identify valuable clips (make notes of the timestamps here), and a third time to really dig in and identify the WHYs. When seeking out your WHYs, it’s best to work backward from the result: what was the cause of that outcome, what was the source. Trace that back to where the play originated. Once you’ve captured your footage, you can watch it as a whole with your team or break it down into the most important clips. These can be shared to YouTube or GFYCAT to be distributed as GIFs—Keith keeps a very organized system of clips and GIFs he can pull from. And if you want to go the extra step, put together a simple highlight or pump-up reel for your team; your players will love you for it. A final word to the wise: watch for successes too. Analyzing game film isn’t all about picking out the holes in a play or finding weaknesses; it should be as much about identifying and celebrating the wins. You can catch more presentations like this at our upcoming 5th annual URCA Conference in late February. It’s your best chance to hear from the top coaches around the world and what they consider their secrets to success. Enter your email below to be notified when you can sign up.